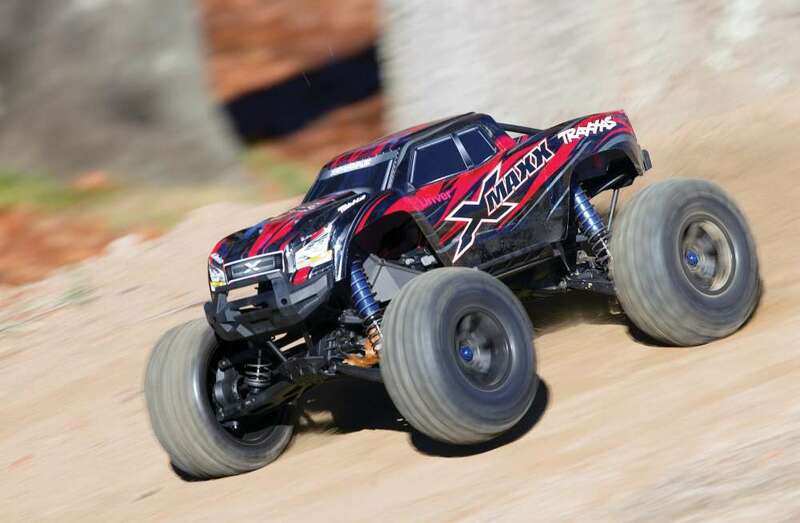 The Traxxas X-Maxx continues to be one of the most exciting, action packed RC vehicles to dominate the basher side of the RC world. The oversized and over-powered truck is incredible to watch and drive. But with any vehicle on the market, drivers want options. Maxx owners want the ability to tweak, tune and customize. That’s where the accessory pros at Pro-Line Racing come in. 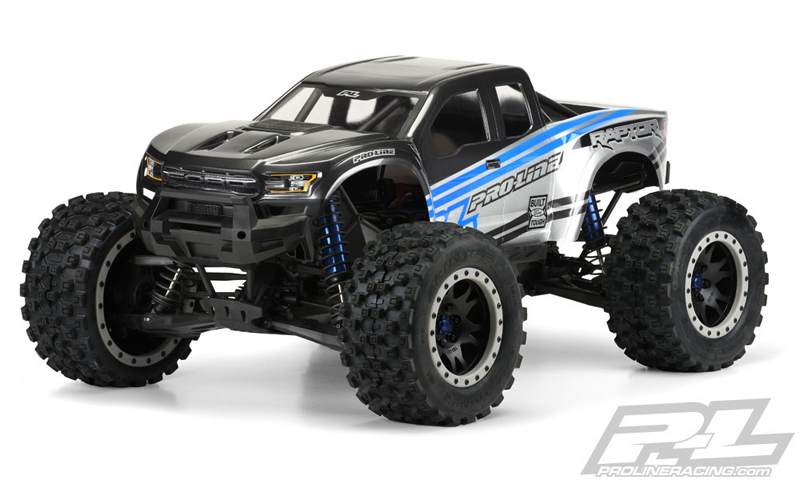 Pro-Line continually identifies RC vehicles that lead in their segment of the hobby and develops option parts for them that will alter their look and even overall performance. Pro-Line has done that with the X-Maxx. Pro-Line has taken their expertise in performance and applied it to a number of products that will take your X-Maxx to a new level. With some recent additions to the line of products for this truck we thought we should gather all that is offered in one spot so you can decided on what option offerings could be right for you. This might be one of Pro-Line most stunning bodies yet. The body design has captured the new 2019 Chevy® Silverado™ styling in the new pre-cut clear body for X-MAXX®. 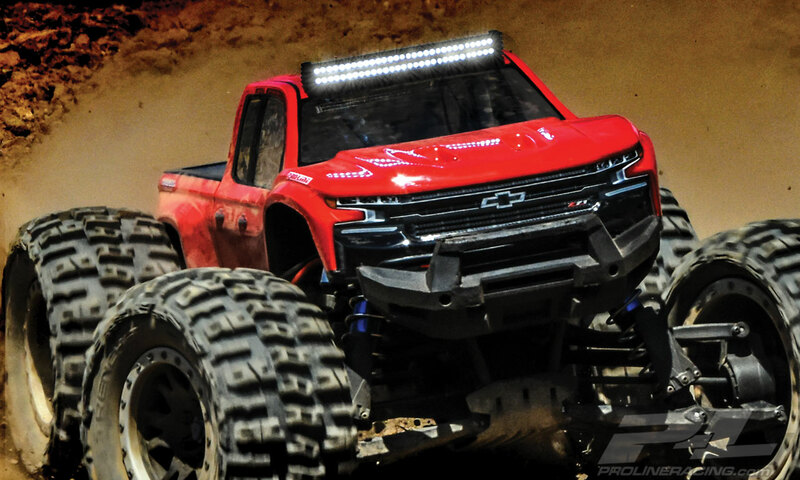 Pro-Line now has the ultimate licensed Chevy® body specifically made for the X-MAXX® – the 2019 Chevy® Silverado™ Z71 Trail Boss! The full size 2019 Chevy® Silverado™ is extremely popular and has a distinct look that will separate your truck from the rest. Pro-Line has included all the aggressive scale detail into the body and sticker sheet for a highly detailed replica and it comes Pre-Cut to get you going faster. This body completely transforms your X-MAXX® into an even crazier Bash Machine and allows you to add a custom paint job! Give your X-MAXX® the tough off-road look it deserves with Pro-Line’s new Chevy® Silverado™ body! We’ve just added one of these bodies to our X-Maxx, we like it so much. 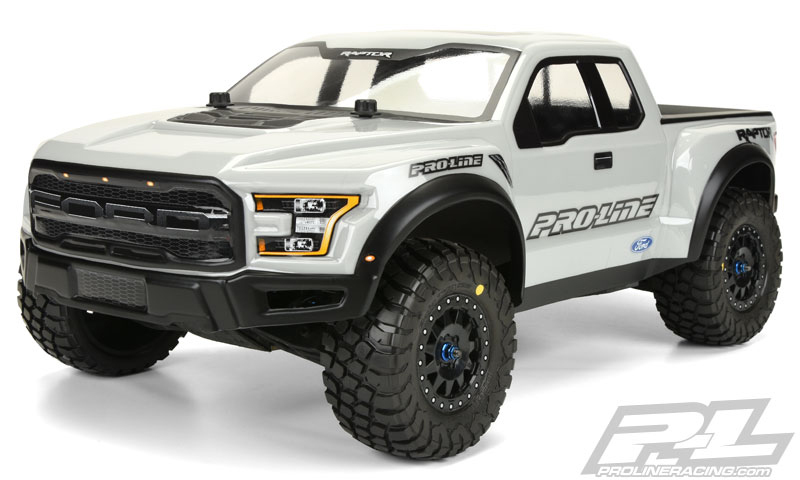 This is a Pro-Line 2017 Ford® Raptor Body for the X-MAXX®. Pro-Line has included all the aggressive scale detail into the body and sticker sheet for a highly detailed replica and it comes Pre-Cut to get you going faster. The 2017 Raptor has a bold and tough body style that is the most cutting edge look available. 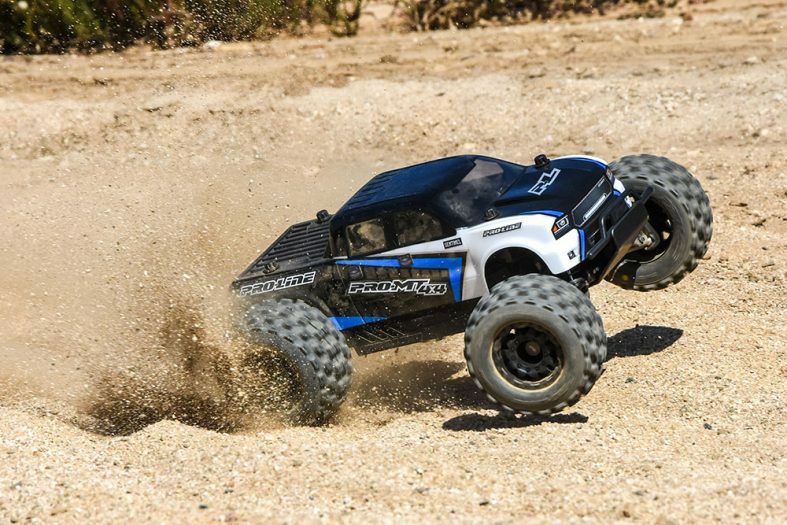 This body completely transforms your X-MAXX® into an even crazier Bash Machine and allows you to add a custom paint job! 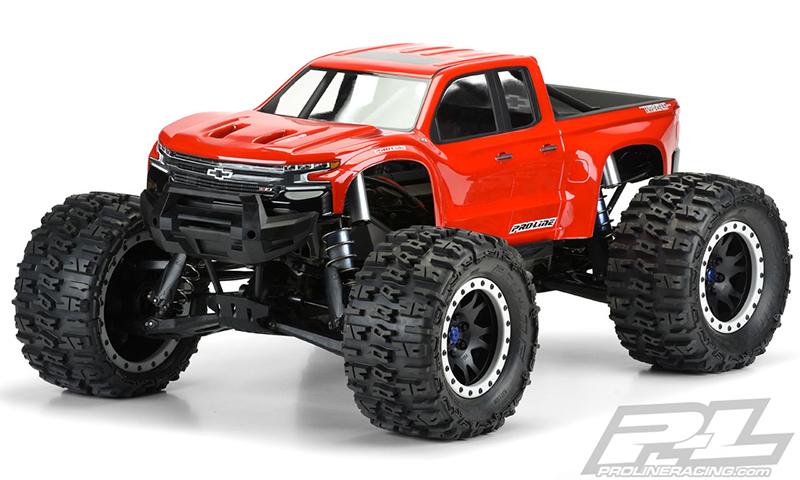 If you are a Raptor or X-MAXX® fan, then this is the body for you! 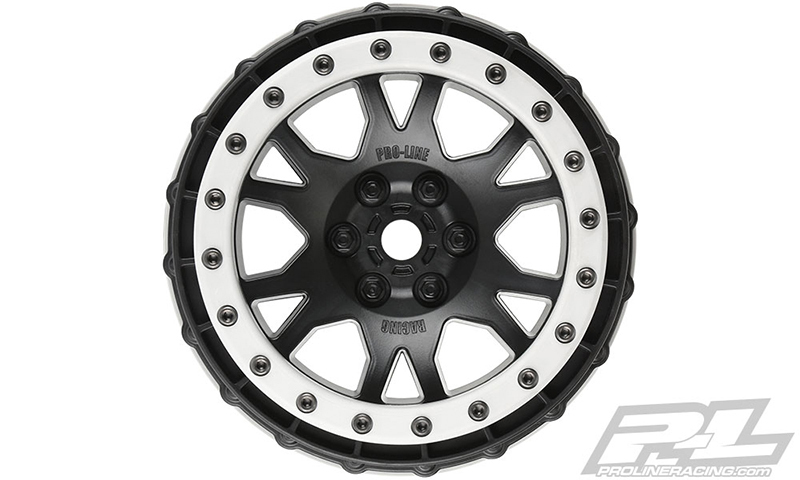 The wheels from Pro-Line are perhaps the most well designed rims in RC and this holds true for the Impulse Pro-Loc Wheels for X-MAXX®. The Impulse features a ground breaking Bead-Loc design that allows users to change tires or foams when necessary without worrying about the tires coming out of the bead. Pro-Line’s proprietary Pro-Loc Technology brings this feature to life and creates an ultra-secure bond between Pro-Line’s Pro-Loc Tires and Pro-Line’s Impulse Pro-Loc Wheels. The reinforced Tire bead of Pro-Line’s Pro-Loc Tires fits into a uniquely shaped channel on the wheel and the bead-loc screws actually pass through the tire rubber before being pinched by the outer bead-loc ring to create the maximum possible mounting security. The Impulse design is inspired by full-size off-road wheels with a Tough, Blacked-out look and is manufactured at Pro-Line Headquarters in the USA out of extra thick, extremely durable material designed to take some serious abuse. The look of the Impulse Pro-Loc Wheel is finished off with the Stone Gray Bead-Loc Ring that will get your truck noticed wherever you go! So what type of PL tire fan are you? A Badlands driver or a Trencher? The Badlands tread compound is one of our favorites. Pro-Line Badlands tires are known for having a sweet Motocross inspired tread and the all-new Badlands MX43 tires kick that up a notch with a Bigger and Bolder knobby tread that matches modern MX tire design. These tires have been developed from the ground up for extreme X-MAXX® punishment with an all-new ultra-durable compound that prevents tire ballooning even at high speeds. The Badlands MX43 features Pro-Line’s ground breaking proprietary Pro-Loc Technology that creates an ultra-secure bond to Pro-Line’s Impulse Pro-Loc X-MAXX® wheels while still being removable when required. The reinforced Tire bead fits into a uniquely shaped channel on the wheel and the bead-loc screws actually pass through the tire rubber before being pinched by the outer bead-loc ring to create the maximum possible mounting security. The Badlands MX43 is a true All-Terrain tire that will find traction on any surface but is best suited for loose & loamy dirt, mud or grass. Just imagine your X-MAXX® throwing up huge rooster tails with these aggressive looking tires! Meet the Pro-Line Trencher, one of PL’s most loved basher tire and now it’s available in 4.3″ Pro-Loc Tires. 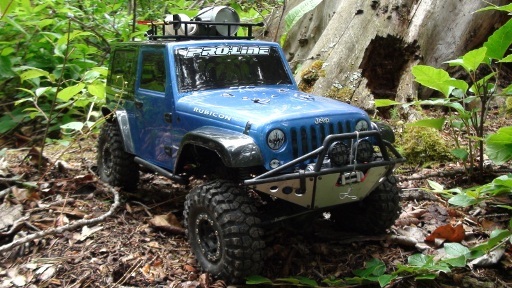 Pro-Line is ready to unleash the incredibly popular Trencher tread super-sized for your X-MAXX®! The Trencher tread was designed to have ultimate traction combined with long-lasting durability. Each tire lug is shaped to dig into whatever surface you are running on and is ultra-thick so that it is extremely durable. The Trencher 4.3″ tire features Pro-Line’s ground breaking proprietary Pro-Loc Technology that creates an ultra-secure bond to Pro-Line’s Impulse Pro-Loc X-MAXX® wheels while still being removable when required. The reinforced Tire bead fits into a uniquely shaped channel on the wheel and the bead-loc screws actually pass through the tire rubber before being pinched by the outer bead-loc ring to create the maximum possible mounting security. Go above and beyond! 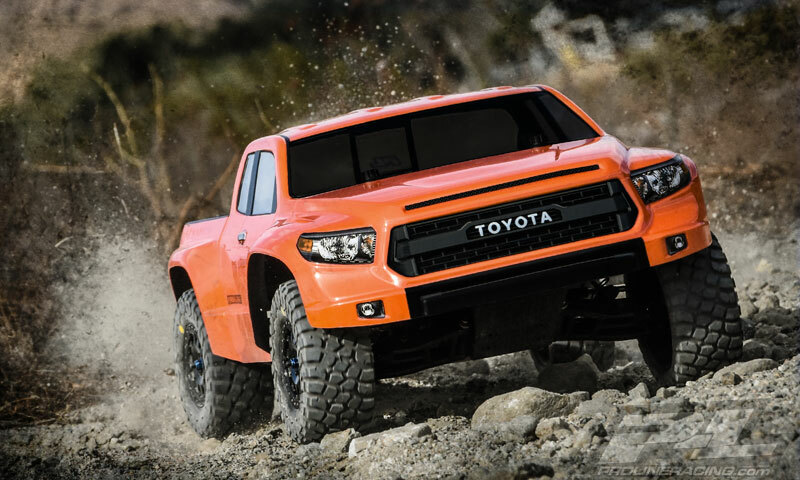 Want to thrash in the sand or go all stunt crazy and rip your truck across some puddles? Pro-Line Sling Shot paddle tire for X-MAXX® are known for having an incredible scale paddle tire appearance combined with unbelievable Sand and Snow performance! These tires have been developed from the ground up for extreme X-MAXX® punishment with an all-new ultra-durable compound that prevents tire ballooning even at high speeds. 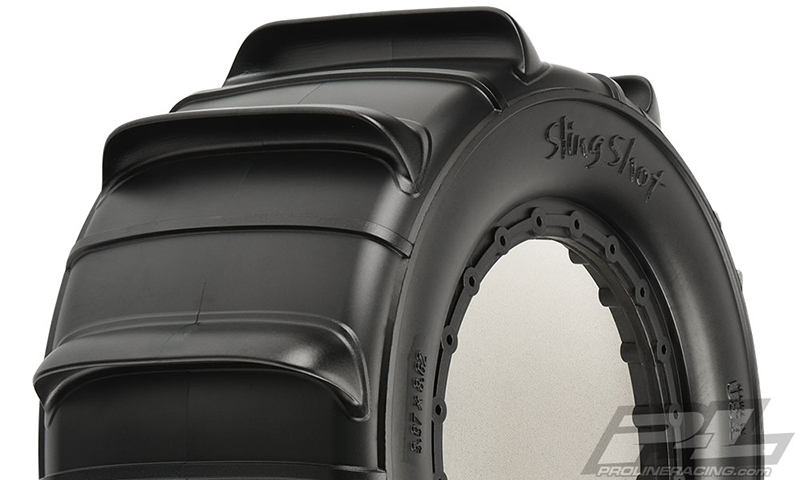 The Sling Shot 4.3” tire features Pro-Line’s ground breaking proprietary Pro-Loc Technology that creates an ultra-secure bond to Pro-Line’s Impulse Pro-Loc X-MAXX® wheels while still being removable when required. The reinforced Tire bead fits into a uniquely shaped channel on the wheel and the bead-loc screws actually pass through the tire rubber before being pinched by the outer bead-loc ring to create the maximum possible mounting security. 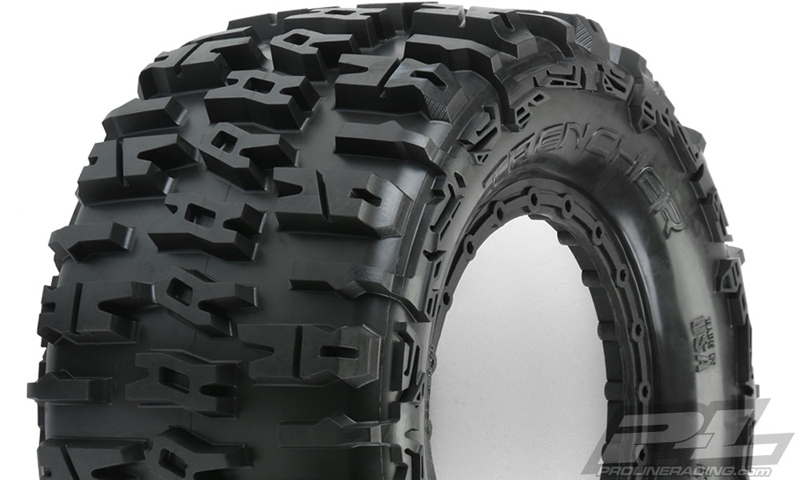 This technology debuted on the Badlands MX43 Pro-Loc Tires and has proven to be extremely popular amongst X-MAXX® fans. 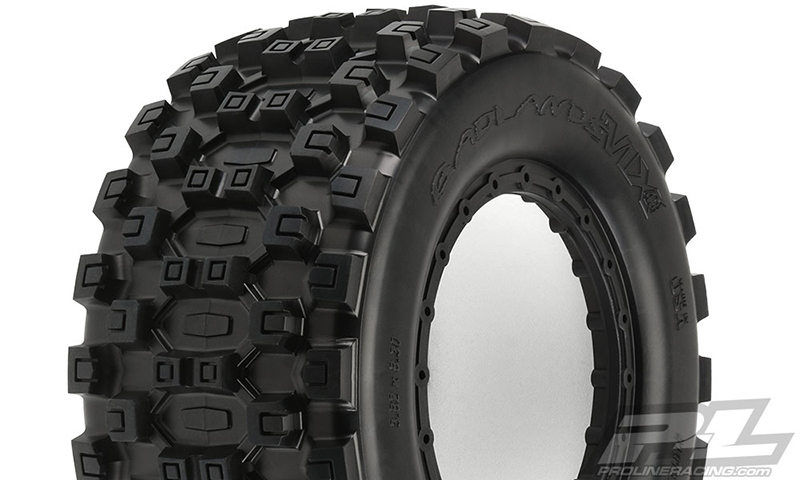 Just imagine your X-MAXX® throwing up huge rooster tails with these aggressive Paddle tires! If you are hard on your equipment, then things happen. If you damamge your Pro-Loc rings, then you’re in luck. This is a pair of Replacement Impulse Pro-Loc Gray Rings. 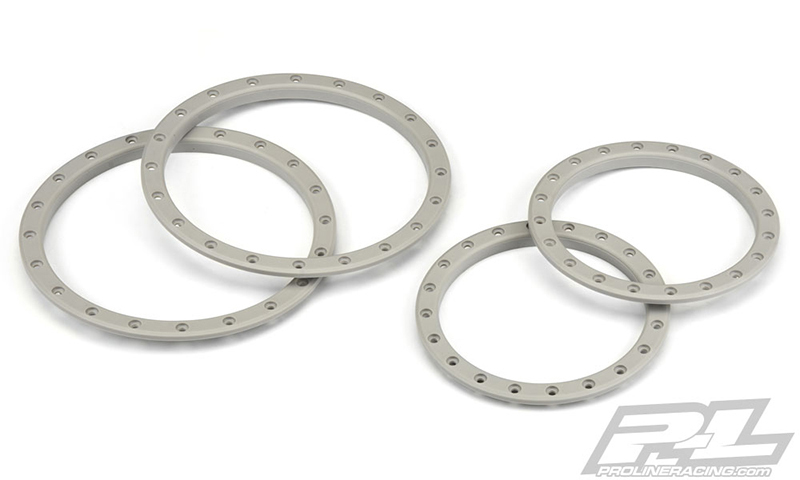 Pro-Line X-MAXX® fans have been requesting the Impulse Pro-Loc Wheel Rings separately and now they are! Now you can get creative with paint or dye to customize the look of your Pro-Line Impulse Pro-Loc wheels. Certainly a worthy upgrade for those that demand the most peformance out of their X-Maxx. This pair Pro-Line’s Ultra Reservoir Shock Caps fits directly onto the stock X-MAXX® shocks and transform them into fully functional Reservoir Shocks! The additional Reservoir provides more oil volume to your X-MAXX® shocks which results in cooler shock temps and improved shock consistency. 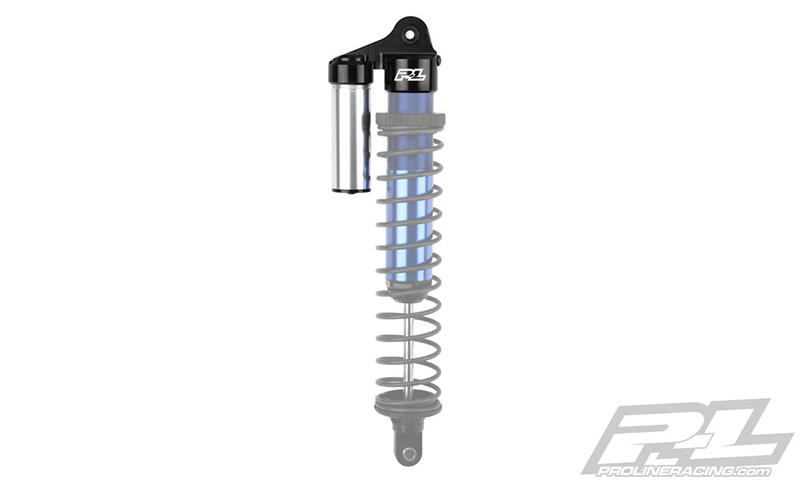 The Reservoir Piston compensates for the volume of the Shock Shaft delivering Plush Performance over small bumps and large jumps just like full-scale shocks! The included Shock Cap, Reservoir, Piston and Bottom Cap have all been expertly CNC machined out of high grade Aluminum to exacting specifications to meet the demands of the enormous X-MAXX®. The included O-Rings provide the sealing you need and Delrin upper Pivot Balls are included for optimum performance. Transform the Performance of your X-MAXX®. Single rate spring? Sure, it will work, but what about the advantages of a dual rate spring? 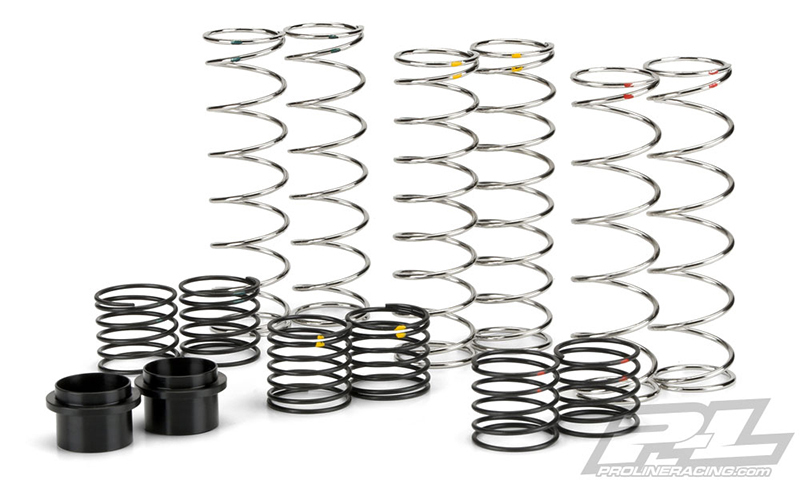 The Dual Rate Spring Assortment for the X-MAXX® will add more performance, style and function to your X-MAXX® shocks. The spring assortment pack includes a pair each of Soft (Green), Medium (Yellow) and Firm (Red) Upper and Lower springs that can be mixed and matched to give you tons of tuning options. The main benefit of using Dual Rate Springs is that you can have a softer initial combined spring rate for gliding over the small choppy bumps, but then transition to a much firmer rate once the Upper Spring is collapsed to absorb the Big Hits! It’s truly the best of both worlds! The spring separator is custom machined from Black Delrin for smooth sliding action over the shock body and the shoulder is offset so upper spring collapses consistently for proper performance. The Upper Springs are Black and the Lower Springs are bright Zinc Coated for a chrome-like finish to set your X-MAXX apart from the rest.